I bought the 928 S4 in December 1999. Happy as a child, of course. 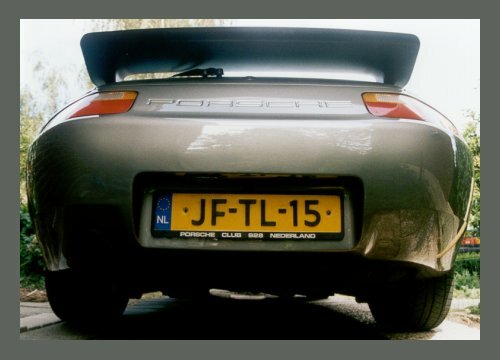 But after a couple of weeks I thought that the yellow NL (Netherlands country identification) sticker was not fixed up nicely on the rear bumper. At that time, such a sticker was obliged, but it was fixed up a little on one side and a bit creased, so it was time to get it off. But it appeared that the sticker was not for nothing fixed up badly. Beneath the sticker was an ugly damage. 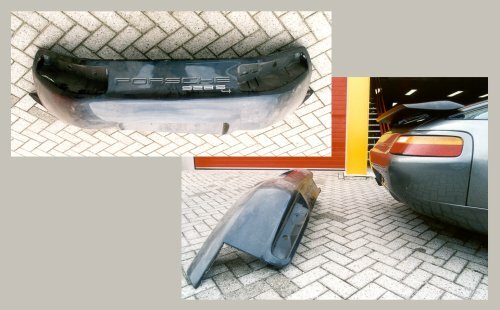 It was obvious the 928 had been in contact with something "hard". Besides that it was also badly repaired. Sick of it of course, but to repair it right away, did not fit into my (money) schedule as well. Two and a half years later it had to come of it. Most important reason, the owner of the garage came in possession of a reasonable perfect S4 bumper. It is told that new ones are not for sale anymore. You can still buy a GTS rear but then you will end up with a S4 with a reflector, and that is a bad combination. In any case, appointments were made and in June 2002 it had to be done. On the first picture you can see an excision of the damage. The crack is completely through the plastic. It was once repaired with sealant. On the inside were large blobs. 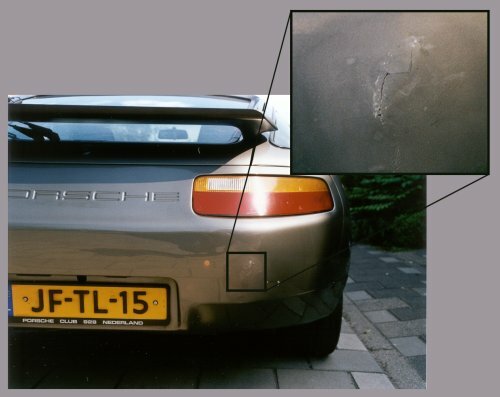 There was also a crack of about 12 centimeters next to the license plate holder on the right side. But that was rather difficult to see. 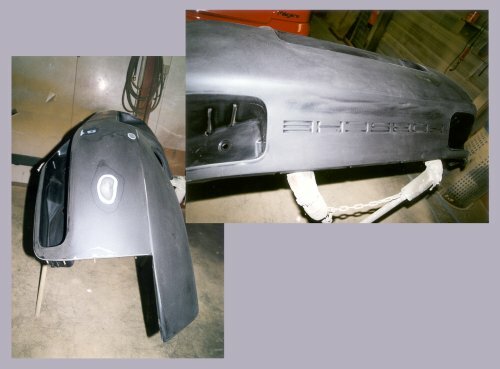 On the next picture you can see the first glimpse of the "new" bumper. Covered with lots of dust, but with only a few scratches. The S4 sticker proves its origin. Of course that was also visible because of the part number on the inside. 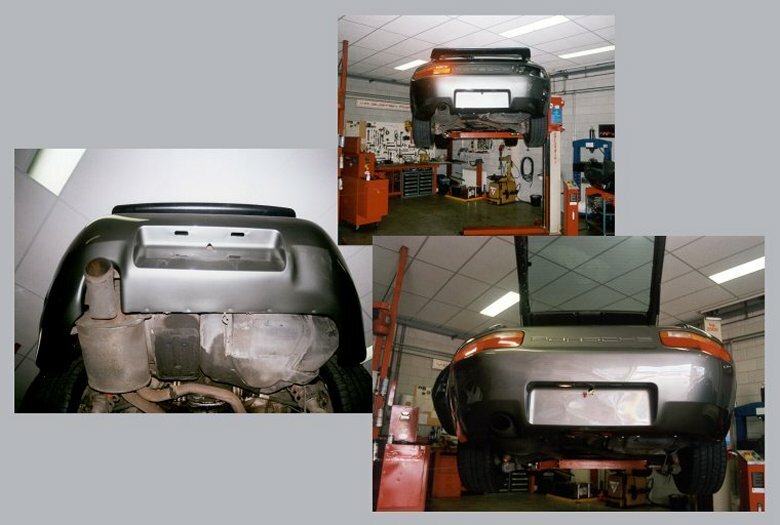 On the right you can see two pictures after the bumper was sand. There are only a few sand marks to eliminate the scratches. Sanding is better than stop with filler. In that case you sometimes see difference in materials, especially when the major component is very flexible. I took a risk with the color. Because the paint was metallic, normally the car has to be partly sprayed too. Otherwise the chance of difference is color is large. But in that case the job is a lot more expensive. But because there is some rubber between the bumper and the rest of the body, I took the chance. And also because it was said it was a good painter. On the picture below the first coat of primer is put up. Now it is starting to look like something. The air in the paint cabin was still warm, but I was allowed to go in to take a few pictures. The smell of paint drying and the bright light, made it turn into a unique atmosphere. At that time the color did not look ok at all, but with "strange" light that it rather a rule than an exception. On the left in the picture below you see the bottom. Probably undamaged for the last time, because that part has to suffer from heightening of road surface (how do you say that in English, sills or bars? Please let me know). On top in the picture below the left rear-light is assembled and on the right both rear-lights and one registration plate illumination. You can't see it too good on the pictures, but the color matches really well. With a very good eye and good light you can see that the color is a fraction lighter that the rest of the bodywork, but it is not conspicuous. There will be more pictures of the assemblage, but the garage owner still has to develop the film. The bumper (second-hand): 200 euro. 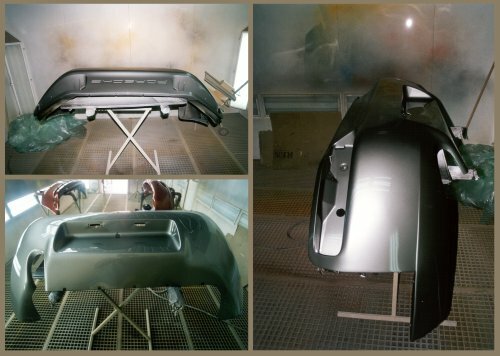 Sanding and painting: 225 euro. Dismantle and assemble: 150 euro. All together it was done for 575 euro. But now the car looks a lot better. Of course only when you take a good look, but though I say it who shouldn't, though I do say myself, such a car deserves to drive neatly.